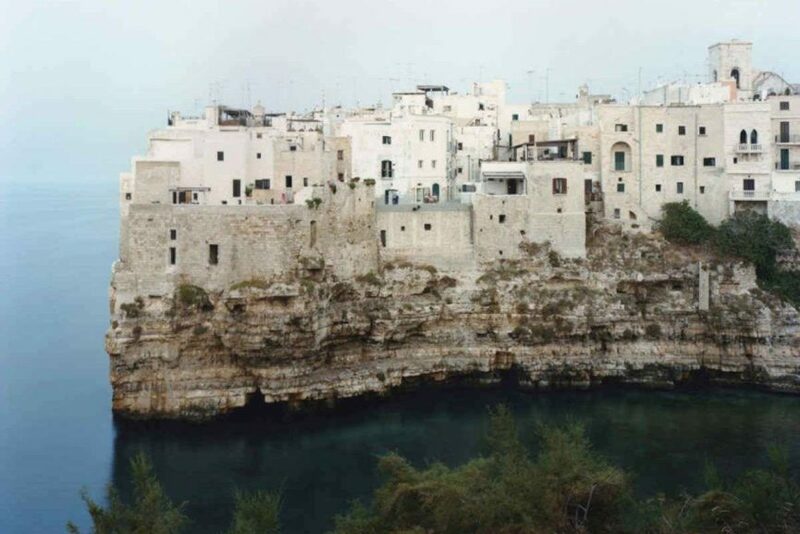 A country with an incredibly rich art history, Italy has boasted prominent names that have influenced generations of artists since ancient times. From Michelangelo and Leonardo Da Vinci to Amadeo Modigliani and Giorgio de Chirico, best Italian artists have created masterpieces of global renown. Besides this rich artistic legacy that continues to inspire new generations of up-and-coming creatives, Italy has an inexhaustible contemporary art scene. 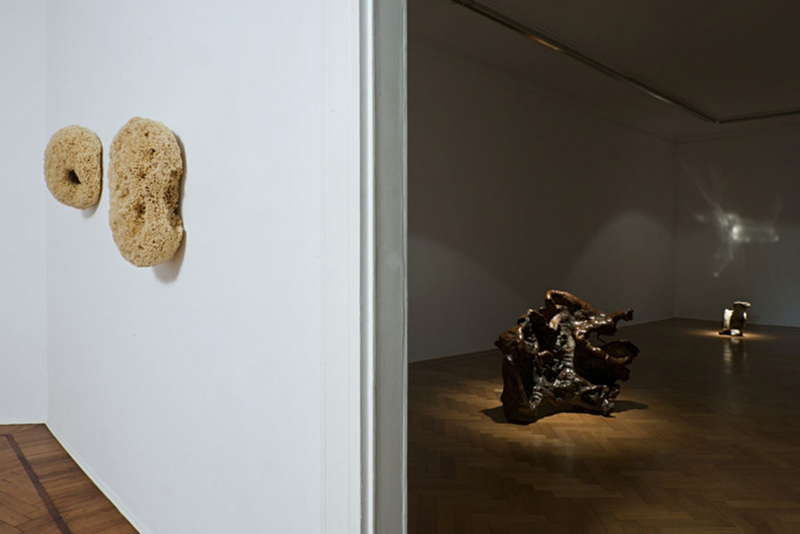 Alongside Venice Biennale that was the first international art exhibition to display Contemporary Art, there are various other institutions and foundations focused on its promotion and development. Famous Italian artists working today retain this iconic skill and innate artistic passion, while utilizing their medium in innovative and unique ways. Additionally, the country has become the home of a thriving group of street artists who have managed to bring their country’s street art scene up to the level of those found in America, Great Britain, and France. Today they are internationally renowned for their art and are painting and exhibiting it all around the world. With an overwhelming number extremely talented young artists coming from this country, creating the following list was not an easy task to do. So, scroll down for the list of most popular Italian artists, as well as emerging ones, you should most definitely know and follow! Zed1 (Marco Burresi) is an Italian street artist who has been active on the urban art scene for more than two decades. Widely recognized for his surreal murals of awkwardly looking plump-face figures and mesmerizing bizarre imagery, Zed1 creates artwork which very often conveys humorous and dark messages of social and political commentary. Zed1’s beautifully executed and highly detailed spray-painted murals, which show his unique and provocative interpretation of shapes, appear like they come from a fairy tale populated by imaginary characters, elves, clowns and puppets. Apart from being strong evidence of his wondrous drawing skills, Buressi’s captivating art, found on walls and canvases all around the world, show artist’s masterful choice of colors. 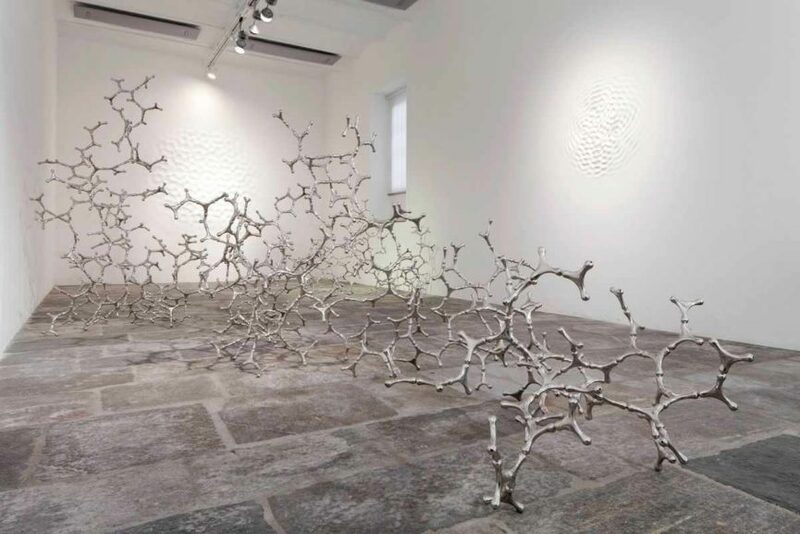 Combining photography, drawing, sculpture, and installation, Loris Cecchini forms a unified poetics, the cardinal element of which is transfiguration. All these different elements in his work interrelate in a constant process of deconstruction and reconstruction. Having a curious nature and intrigued by the correlation between art and life, he explores the results of many different styles and sciences. Based on the idea of a “model”, his work ranges from collages, architectural models and rubber objects to distorted spaces and transparent surfaces. Familiar forms become altered versions that challenge the viewer’s perception. In his series Wallwave Vibrations, Cecchini created relief sculptural tattoos that seem as if pulsating from behind the wall. Working with video, sculpture, installation, painting and drawing, Robert Cuoghi explores the diversity of form and appearance. His practice constantly engages the concept of metamorphosis and change of identities. One of his early works involved his body going through a metamorphic process to become his own father, pushing the physical capacities to the maximum. In another agonizing venture, he wore lenses that flipped his sight 180 degrees, hoping that his brain would eventually account for the shift and right his vision again. One of his recent works from entitled Šuillakku – corral version explores the hybridization through the large-scale, immersive sound installation merging music of Western and non-Western cultures as an imagined ancient Assyrian empire lament. 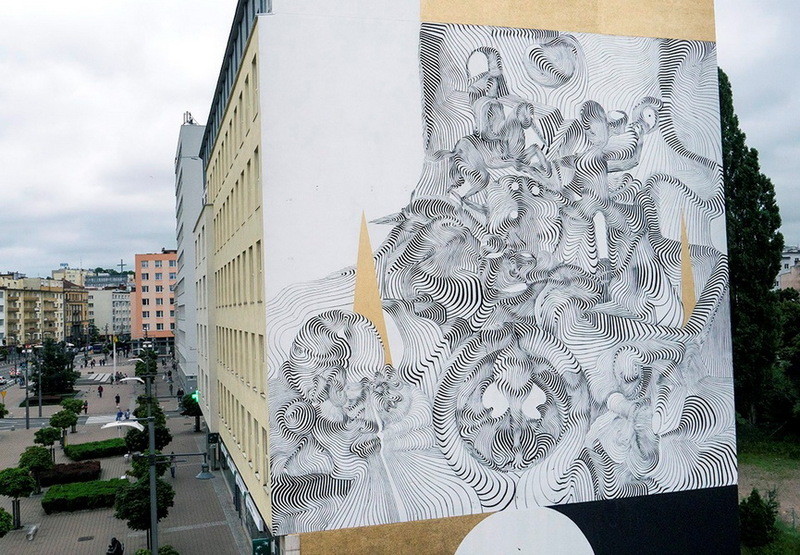 Mind melting and visually compelling monochromatic murals of street artist Never2051 (or just 2501) captivate viewers with their strong abstract imagery and amazingly skillful line work. Created with nothing more than paint brushes and, in most cases, only black and white colors, his paintings of numerous curved lines that turn into wonderfully detailed abstract characters and shapes, demand strong attention from audience in order to be fully comprehended. Being extremely energetic and prolific artist Never2051 has, in the last twenty years, been extremely active in the street art scene and created an astonishing body of work that has been exhibited on walls and in galleries worldwide. 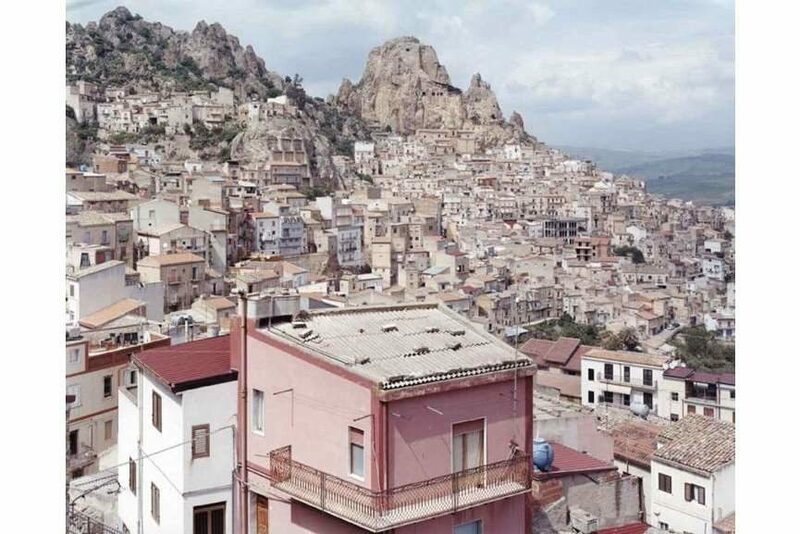 An established Italian photographer, Domingo Milella creates epic contemporary landscapes that reflect the old-age concern of how man and landscape coexist. Capturing caves, tombs, ancient sites and hieroglyphs, cities, homes, and cemeteries, he charts the man’s imprint on earth and the point where civilization meets nature. 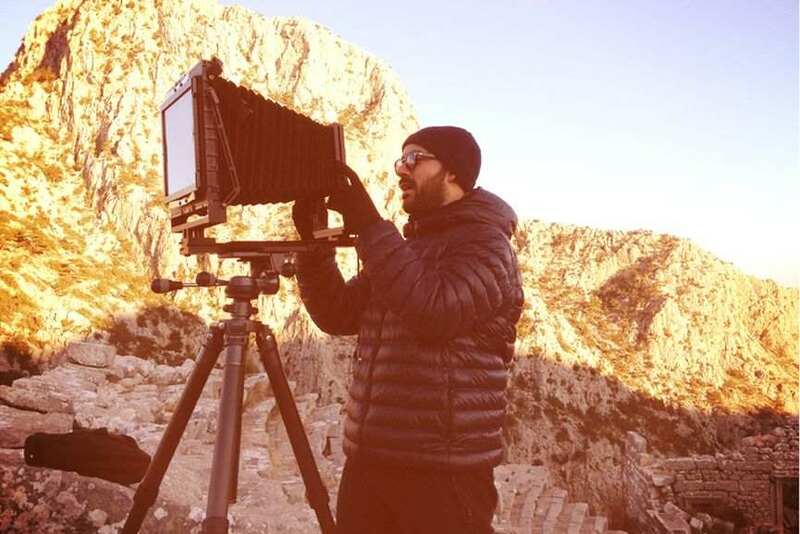 Developing this project over the course of the last nine years, he is focused on creating an aesthetical catalogue of “the human landscape as it is”. These photographs emerge from and challenge classical ideas of the landscape in art history, and seek an alternative iconography in which an almost forgotten past coexists with the present. 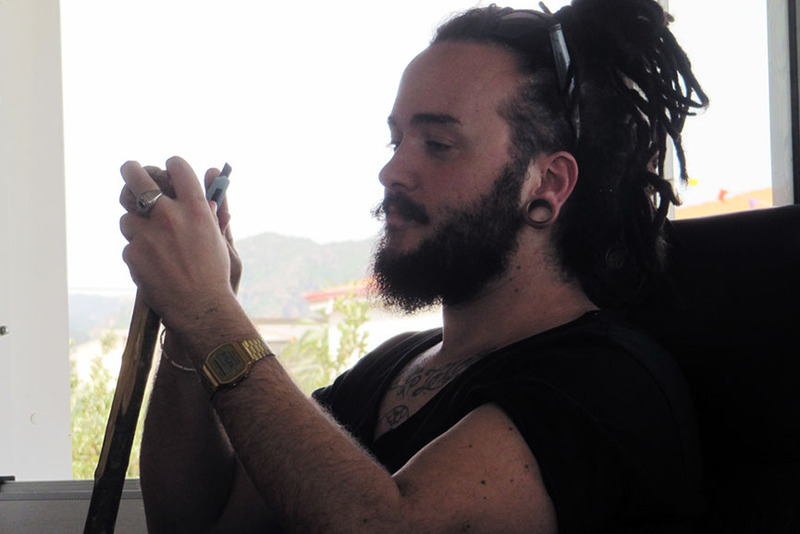 Artistic attitude of Vesod has been greatly influenced by his father, Italian surrealist painter Dovillo Braro. Born in Turin in 1981, he started developing his interest in the graffiti since the early 1990’s. Over the years, while pursuing academic education, he developed a personal painting language which drew inspiration from both renaissance art and futurism. With the idea of representing the three dimensions of space and time, Vesod paints geometric figurative work of exploding colors and deconstructed forms in perfectly balanced compositions. Using nothing more than cans of spray-paint Vesod produces intense and masterful images of high contrast and staggered motion, which blur the borders between fine and street art. Teo Pirisi, also known as Moneyless, got involved in the street art movement during the 1990s as a member of the Tuscany graffiti scene. 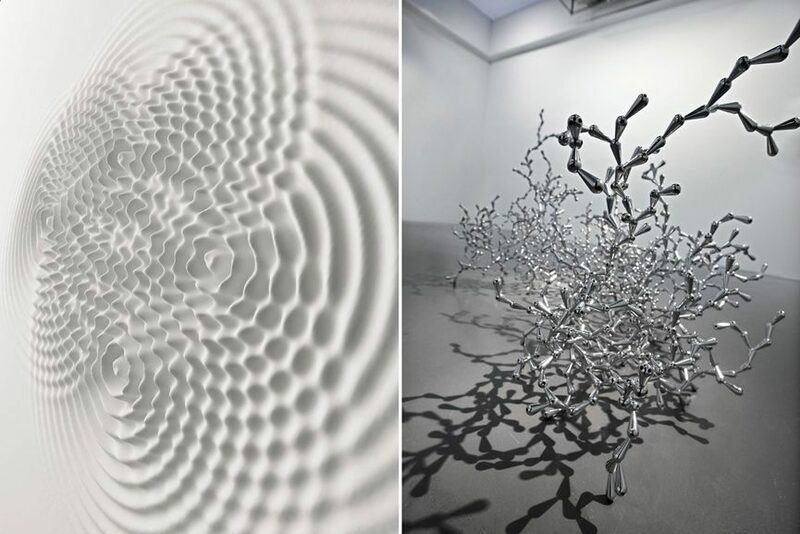 During his studies at Carrara Fine Art Academy he developed his unique signature style of geometric art which seems to quote a Platonic vision of geometry as the foundation of all nature. Coming from the graffiti background, Moneyless experimented with the letter forms, gradually simplifying them to basic lines and geometrical patterns. Through his bedazzling paintings and installations, he shows an amazing artistic ability to transform abandoned or natural environments into cutting-edge, admirable pieces of art by reducing things into their rawest form and trying to say more with less. 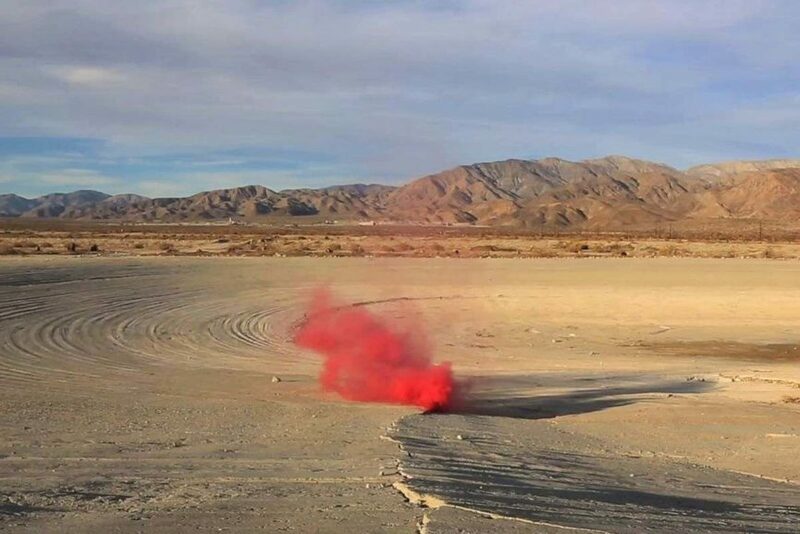 The versatile artist Filippo Minelli was initially engaged in street art, developing his own unique style based on the aesthetics of protest. He brought politics to a new level bay decontextualizing the use of tear gas, reversing the function of flags, and borrowing from the aesthetics of protest slogans. In 2007, Minelli started his ongoing project entitled Contradictions, a land art project where he wrote the names of social networks and corporations on the walls of slums in developing countries pointing out the gap between the reality we live in and the ephemeral world of technologies. 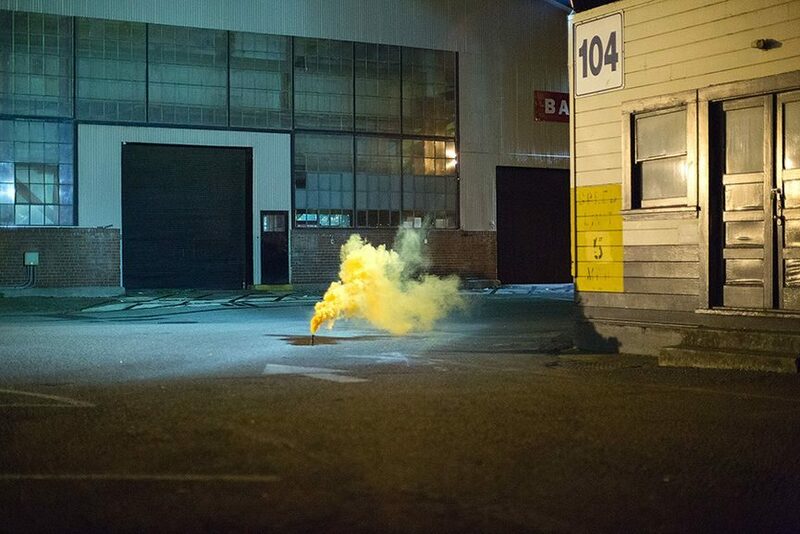 Beginning in 2009, his ongoing photographic series Silence/Shapes portrays smoke bombs in romantic landscapes, juxtaposing the beauty of nature with the violence and chaos in political demonstrations. Peeta (Manuel Di Rita) is an Italian graffiti artist, painter and sculptor who is internationally famed for his mind-boggling three-dimensional graffiti which appear to be flowing above the painted surface. Member of several renowned international graffiti crews (FX, RWK and EAD), a true master of shading techniques through the use of gentle gradients of color, Peeta creates spectacular artworks which give the illusion that light is hitting them from different sides at the same time. Using careful perspective, his perfectly shaped, spraypainted graffiti of formidable visual depth appear like sensational hovering sculptures of vertiginous and shiny shapes that seem to twist and wind in front of the wall. 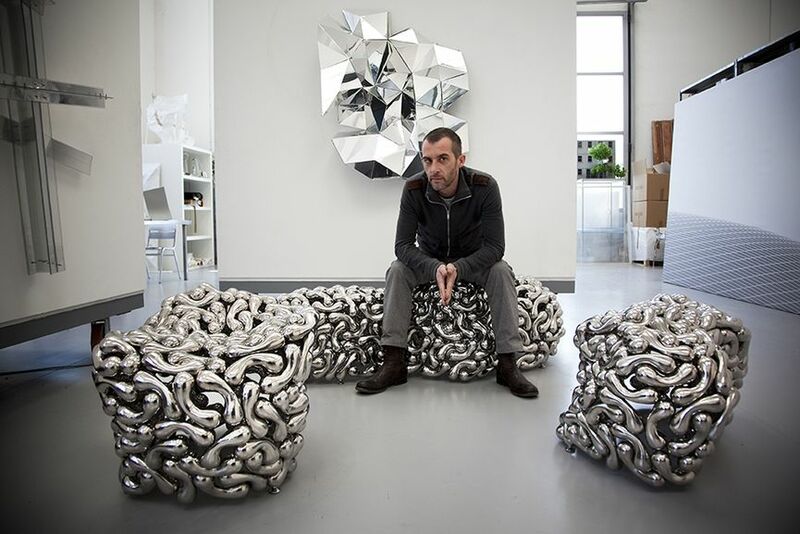 An Italian contemporary artists and designer, Gianluca Traina is best known for his projects PORTRAIT 360. Mostly concentrated on sculpture and painting, he employs different media and materials such as paper and PVC. 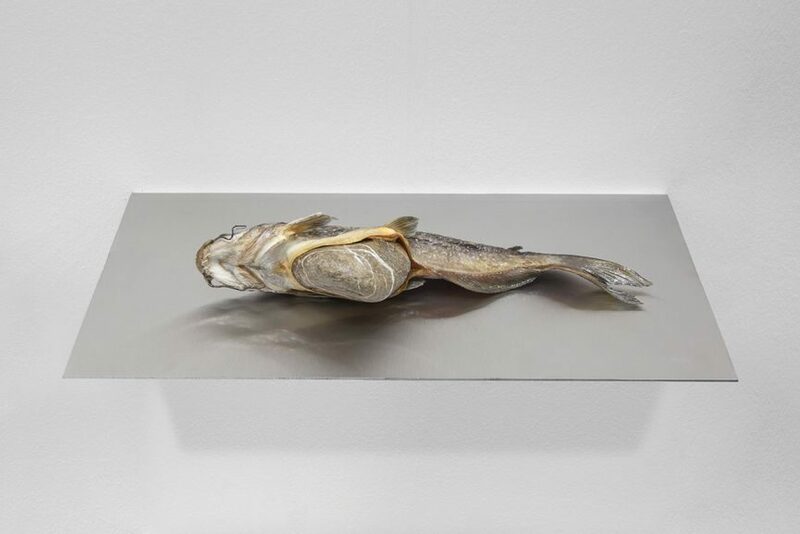 Fusing art, fashion and design, his works strives towards the connection between the art object and the viewer. 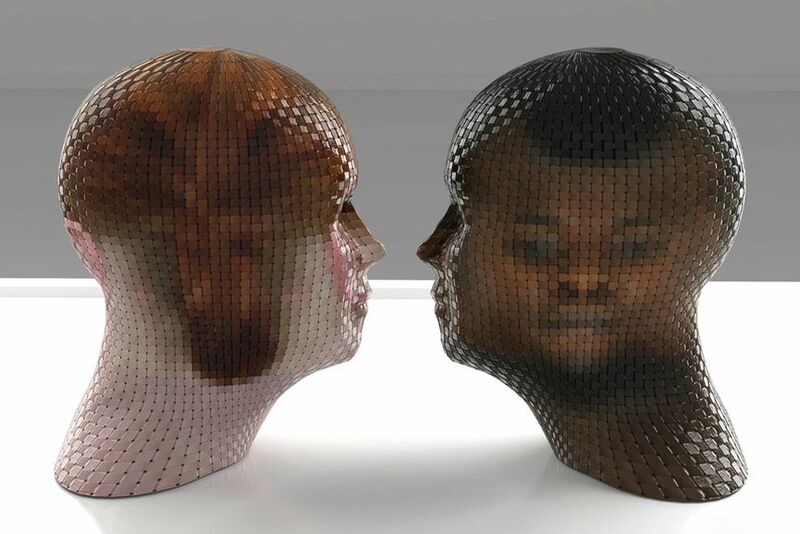 His famous project PORTRAIT 360 is a series of portraits where he incorporated two-dimensional images with three-dimensional elements. Mixing flat surfaces with the contours of the human body, this projects depicts the concept of depersonalization. With deformed portraits resembling a mosaic, these pieces confuse both identity and gender. 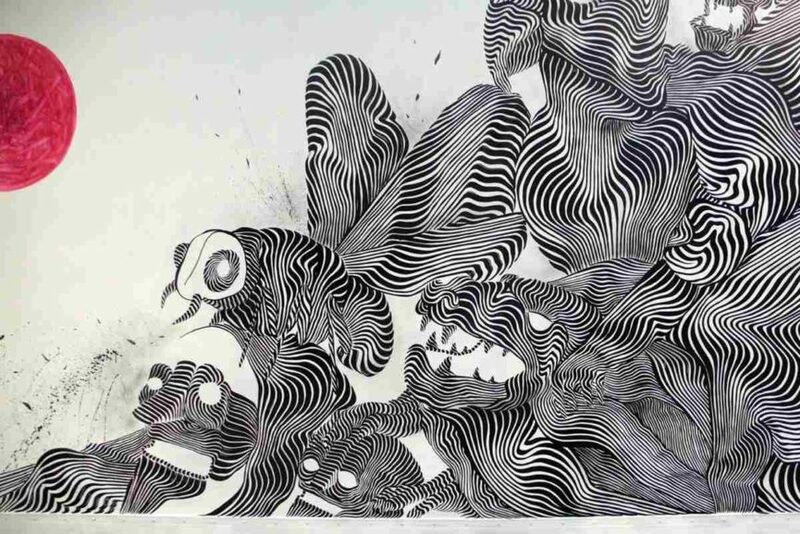 Valerio Berruti is an Italian artist working with drawings, paintings, and sculptures. 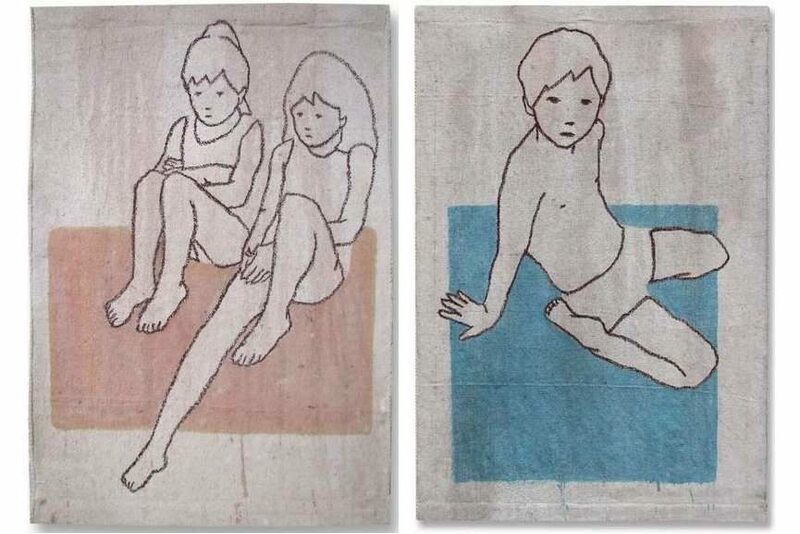 He reproduces images essentially of everyday life and family interactions. 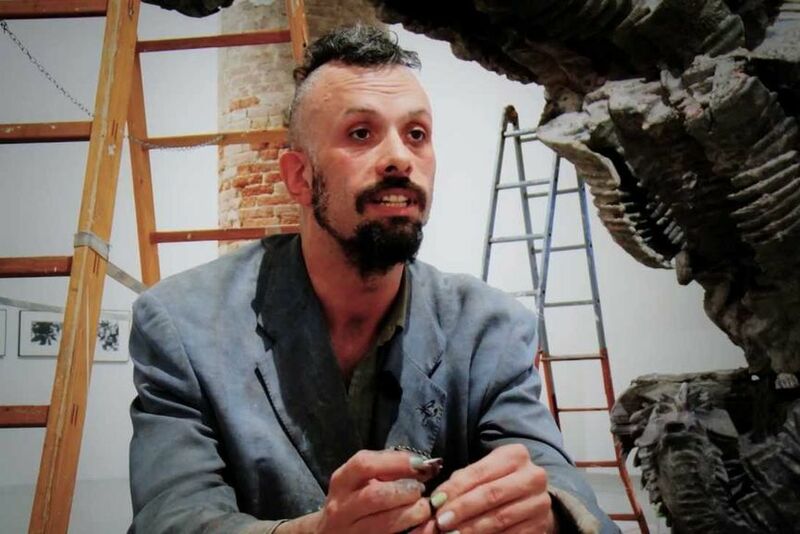 In 2009, he exhibited at the 53rd Biennal in Venice where he presented a video animation composed of 600 drawings put together with music by Paolo Conte. His sculptureProtect me Everywhere from 2012 is created from plasma-cut cor-ten steel and it demarcates the Bricco Rocche estate. 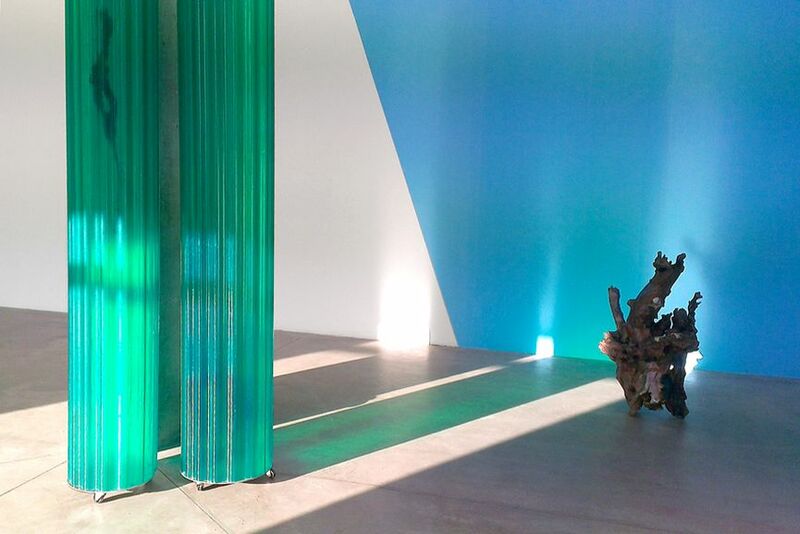 Clean lines casting shadows on the ground form a fundamental and integral element of the work. He currently lives and works in a deconstructed 17th-century church in Verduno which he bought and restored in 1995. Sten & Lex is an Italian street art duo, internationally acclaimed for their stencil art they have been doing together since 2000. Sten (Rome, 1982) and Lex (Taranto, 1982) are considered to be pioneers of urban stencil art in their country, who utilize unique halftone stencil technique combining collage, stencil and op art, style they have developed to perfection. Today they produce gigantic portraits of mainly anonymous people, made from their own photographs and consisting of thousands upon thousands paper strips. 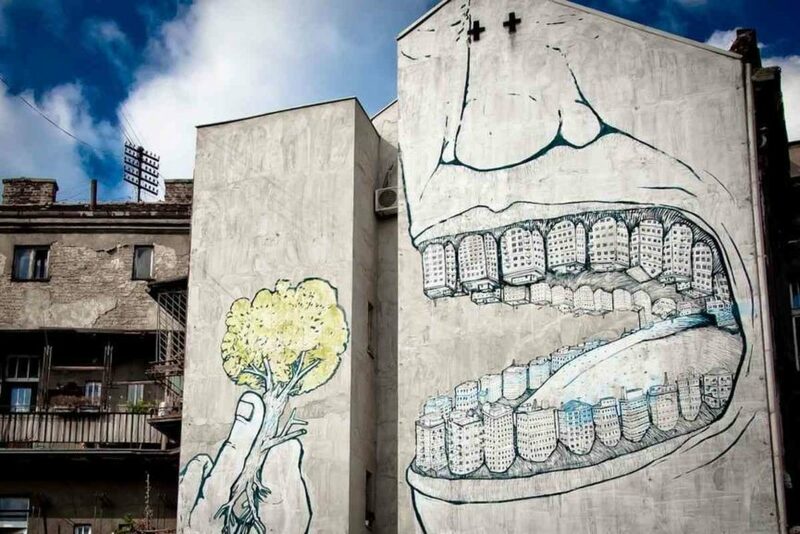 Their art is poetic and at the same time extremely powerful and it has become a part of the urban landscapes of cities such as Rome, London, Paris and New York. The artist Luca Francesconi attempts to explain the phenomena of the world by using the irrational and the “para’s” of the underworld. Through scientific knowledge, biology, physics, ancient philosophy, the occult and magic rituals, he creates personal mythologies with an eminently metaphysical expression. In this way, he tackles complicated themes and issues through seemingly simple forms. 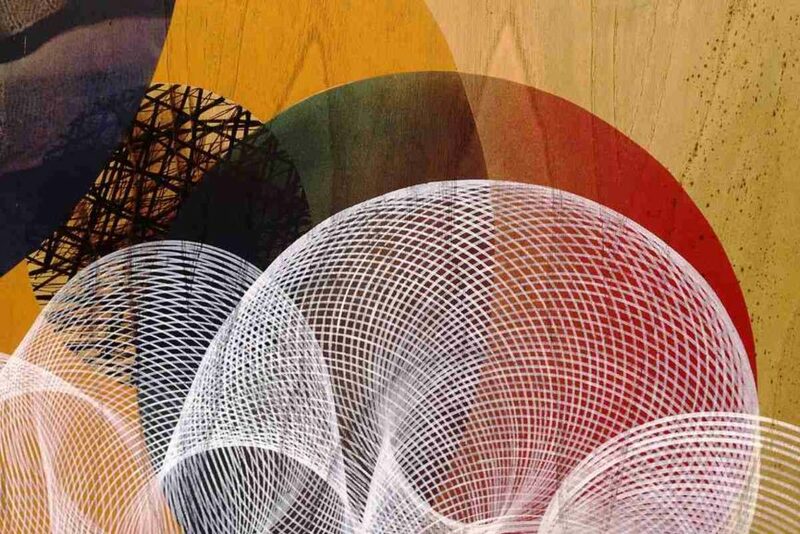 Formed around diverse dualities, his pieces emphasize the relativity of our perception. Using found objects that the river Po carries along, he transforms these discoveries into the very subject of his work. His art connects the nature with culture, attempting to search for the origins of the world. The admiration towards the symbolic rationality is evident throughout his work. Blu is an extraordinary street artist from Bologna who has been involved in the Italian street art scene since the late 1990s. All this time he has been very successful in concealing his true identity, which is pretty fascinating given the sheer size of his easily recognizable public artworks. Blu’s epic scale murals made in house paint, with the use of rollers and telescopic sticks, inhabit urban and industrial landscapes of cities throughout the world and stand as artist’s commentary of social and political controversies. 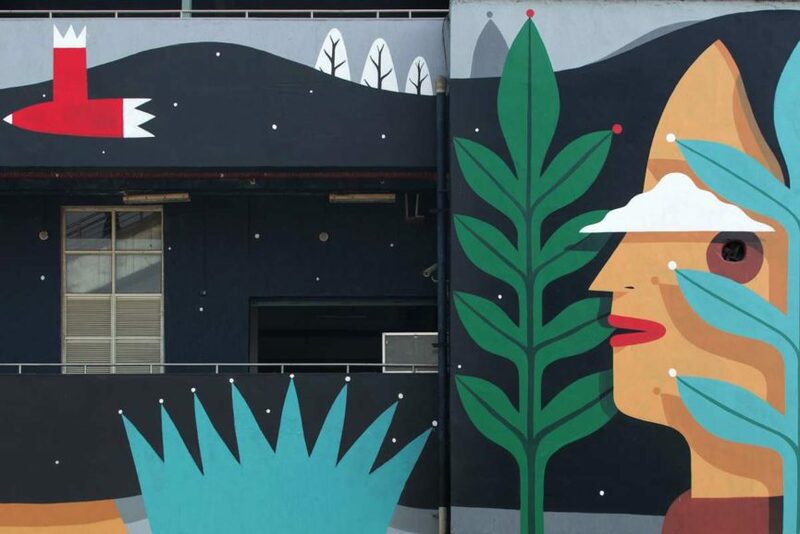 His most famous artwork is a seven-minute silent animated mural called Muto which is composed of hundreds of wall paintings, and which took several months to create in the streets of Buenos Aires. Agostino Iacurci is one of the most prolific Italian street artists, recognized for his monumental, multi-layered and brightly colored murals of synthetic forms and flat shapes. Always considerate of the architecture and context of the environment he works in, Iacurci creates seemingly simple and very accessible artworks of boldly colored, whimsical characters which lack gestures and seem to readily accept bizarre situations they often find themselves in. 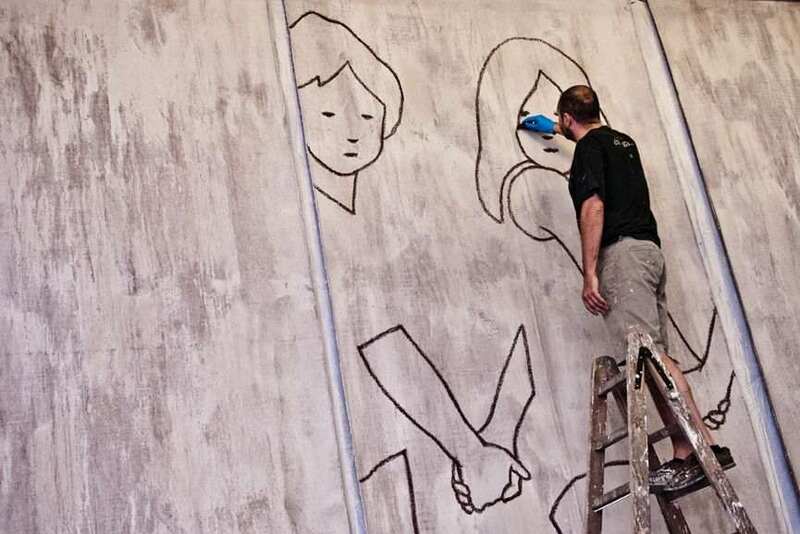 His signature narrative-like style paintings can be found on walls both small and large all around the world, including some of the more exotic locations such as the skyscraper in Taiwan, school in Western Sahara and inside the maximum security prison near Rome. Addressing the way we perceive urban landscape, Andrea De Stefani likes to observe his environment as its critic, finding an array of connections, situations, and even truths. For him, the cognitive process is not amorphous matter. If cognition is an articulated process, whose extent is determined by numerous factors, an attempt to reproduce this experience depends on the disposal of a ‘favourable climate’ in which it can be reproduced as an image in its entirety. This year, he has won the miart fair award, the Menabrea Art Prize, dedicated to artists who are not represented by any gallery. The winning piece is a sculpture entitled On the beach, 2gethr, 4eva, and it is a hybrid of the Japanese bonkei and a tray landscape, all enclosed within a large glass box. Pixel Pancho is a highly talented street artist from Turin and one of the most outstanding protagonists of the Italian urban art scene, who specializes in large-scale murals, and is considered to be one of the most prominent artists in his field. This graduate of fine art studies has been creating original street art work, reminiscent of Michelangelo’s classic compositions, since 2001, steadily gaining a large following. Pixel Pancho uses a wide variety of mediums to create mesmerizing paintings of a 1950’s futuristic fantasy world, filled with hybrid robotic creatures and references to pop culture icons, executed in an earthy color palette which gives them a more ancient feeling. The artistic oeuvre of Giovanni Kronenberg is rather intriguing and it calls to mind the world’s most extravagant wunderkammer. 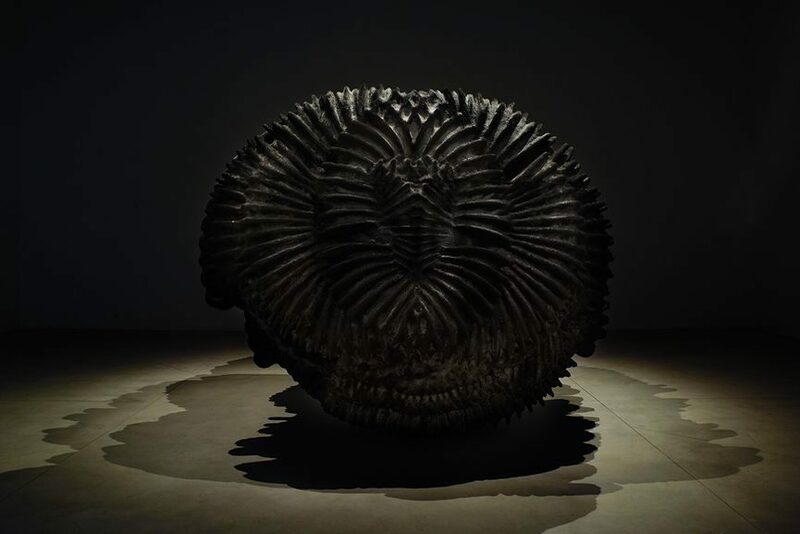 Using objects like sea sponges, a whale vertebra, a 300-years old, large bonsai, the narwhal tooth, and other hard-to-find items coming straight from the cabinet of curiosities, he throws a sharp spotlight on the ancient-like sculptures of natural forms. 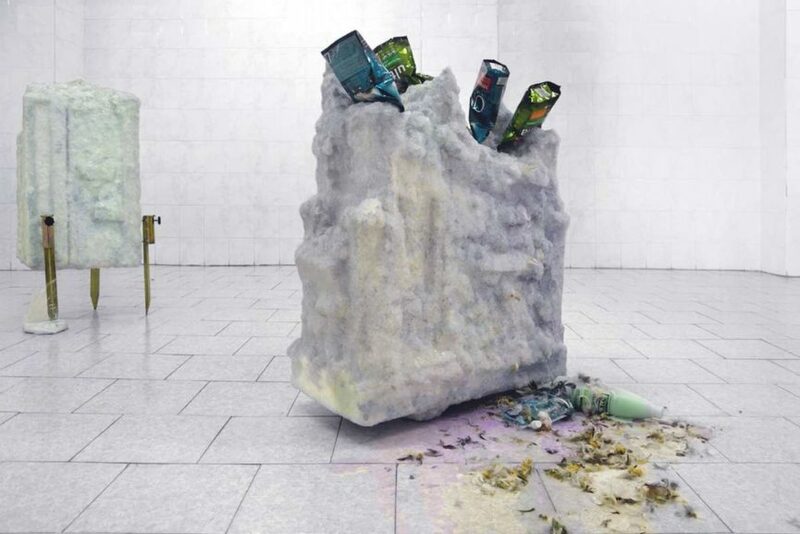 Placed in a suspended time, these sculptures made out of visionary artifacts are surrounded by the elusiveness of geological eras past and future. Taking us back to a different time, his art makes us question our evolution. Inspired by the paradoxes created by the differences between digital images and physical works of art, the work ofMichele Gabriele focuses on the disappointment these differences often end up resulting in. Using a variety of materials such as concrete, dog food, rocks, or appliances, his practice is very versatile. The majority of these materials seem as if they could be found in post-apocalyptic environments. He manages to tame visceral reaction by interacting the ostensibly grotesque with the idea of thematic play. His main interests are the shapes made by humans and the rest of nature, as well as architecture. He describes his pieces as containers for finite narrative. Alo (Aristide Loria) is a street artist from Perugia who has been living and working in London since 2011. He is widely known for his unique abstract and geometric portraiture, which features strong lines, blocks of color and text replacing objects and organs. Alo’s art is strongly influenced by both German expressionism and African art, and it represents the artist’s research of human feelings and troubles. Alo creates all of his public works on site, but he very often cleverly chooses to paint over previously fly posted posters to give his pieces an effect of paste up, and even though he uses the same technique for each of his colorful pieces, each character he paints retains its own personality. Inviato su ARTWORKS, like it, Portrait 360, Senza categoriaTag art, Gianluca Traina, intreccio, italian artist, paper, Portrait 360, ROBERT FONTAINE GALLERY, sculpturesBookmark the permalink.